During the beginning of the cold war, Killeen Base was one of the Air Force's storage-and-assembly bases for nuclear weapons. Gray Air Force Base near the AEC's Killeen Base (Site Baker), one of three National Stockpile Sites where nuclear weapons were stored at the time. The evidence for a UFO/Nuclear Connection grows stronger by the day. Official FBI, CIA, Army and Air Force documents establish, beyond a doubt, that UFOs have been seen and reported where uranium was mined and plutonium was manufactured (the Congo, New Mexico, The Oak Ridge, Tennessee, the Hanford Plant at Washington, the Savannah River facility at South Carolina). Official reports are on file of UFOs seen where bomb development took place (Los Alamos, Sandia Base) and where nuclear weapons were stored (New Mexico: Los Alamos,Manzano Mountain near Kirtland, NM, and Texas: Killeen Base ant Camp Hood). This is the second part of that story, the Camp Hood Sightings, which we produced to include all the known cases and provided links to the full report directories and official supporting documents. The matrix for this chronology is based on the portion of the book, "The Report on Unidentified Flying Objects", by Captain Edward J. Ruppelt, where these sightings and the story surrounding them is covered in detail. Where enough information is not available to produce a case directory, the supporting documents are provided as temporary directories. I wish to thank Dan Wilson, one of our staff researchers, for his fine research into the Blue Book Archives for the supporting documents in most of these cases. And to Brad Sparks for his re-evaluation of the Project Blue Book Unknowns which doubled the number of cases that were unexplained, many of which occurred in New Mexico and other high-security areas such as Oak Ridge (TN) and Killeen Base (TX) and were used as a checklist. Jan Aldrich provided documentation on some cases; Richard Hall provided the chronologies and basic case lists (UFOE, UFOE II); and Jean Waskiewicz and I created a set of useable databases within the NICAP Global Sighting Information Database) for the total caseload. But after about two weeks of nightly sightings and no apparent action by the Air Force, the commander of the installation decided to take the initiative and set a trap. His staff worked out a plan in record time. Special UFO patrols would be sent out into the security area and they would be furnished with sighting equipment. This could be the equipment that they normally used for fire control. Each patrol would be sent to a specific location and would set up a command post. Operating out of the command post, at points where the sky could be observed, would be sighting teams. Each team had sighting equipment to measure the elevation and azimuth angle of the UFO. Four men were to be on each team, an instrument man, a timer, a recorder, and a radio operator. All the UFO patrols would be assigned special radio frequencies. Many people thought that the plan was killed so that too many people wouldn't find out the truth about UFO's. Others thought somebody was just plain stupid. Neither was true. The answer was simply that the official attitude toward UFO's had drastically changed in the past few months. They didn't exist, they couldn't exist. It was the belief at ATIC that the one last mystery, the green fireballs, had been solved a few days before at Los Alamos. The fireballs were meteors and Project Twinkle would prove it. Any further investigation by the Army would be a waste of time and effort. This drastic change in official attitude is as difficult to explain as it was difficult for many people who knew what was going on inside Project Sign to believe. I use the words "official attitude" because at this time UFO's had become as controversial a subject as they are today. All through intelligence circles people had chosen sides and the two UFO factions that exist today were born. 1:45 am. PFC Max Eugene Manlove, 1st Provost Squadron, observed a teardrop-shaped object, orange in color, drop vertically in front of him. Observation time: 2 seconds. 8:30-10 p.m. Several Army security patrols sighted a variety of strange lights, mostly slow­moving changing color from white to red to green, one with a red blinking light, one with a "cone­shaped affair" trailing in the rear similar to one seen the day before. (FOIA) The documents are 58 pages long! An incredible report. Numerous military witnesses observed a round silver thin object, rocking giving an edgewise and sizewize view, 30 degrees altitude. Object in sight for approximately 5 minutes. Object moved about 15 to 20 miles during observation. Maneuvers: Irregular rolling and tilting motion slowly rising as it travelled away. Page 5 -- A major conference with many high ranking officials attending, especially H. L Gandy, Lieut. Col, Commanding Officer, Killeen Base. Page 6.-- "During the day(May 5 conference day), all representatives of Fourth Army expressed great concern about the unknown phenomena as they believed the sightings to be valid." "a sufficient number of manifestations to cause grave concern." "since the airstrip was on property which had been turned over to the supervision and control of the Eighth Air Force" Meaning the airstrip at Killeen Base. This would later become Gray AFB. Page 7.-- "they had sightings made at Fort Worth of high speed aerial objects"
"On 19 May 1949, the plan for the reporting phenomena as drawn up by Fourth Army was furnished this office. 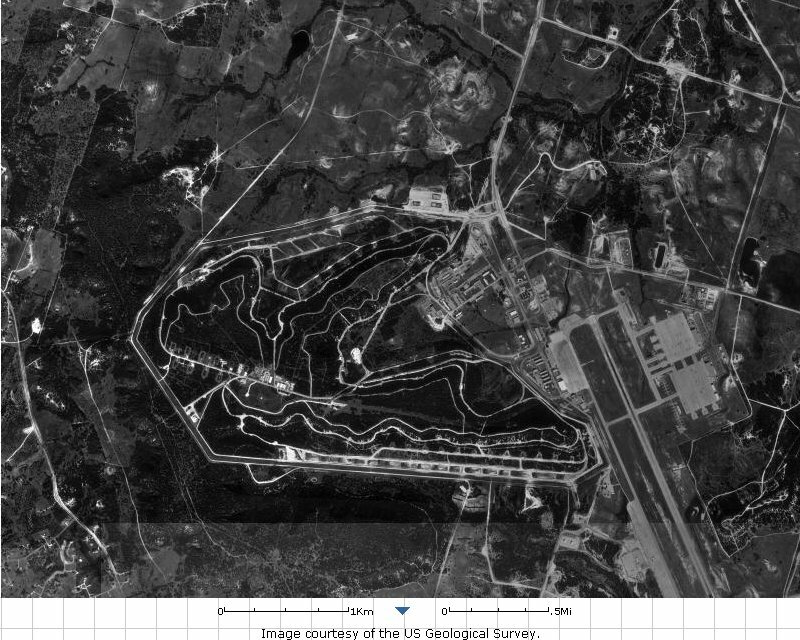 Date of this plan is 4 May 1949, and provides for a precise and comprehensive observers network in the Camp Hood area adjacent to Camp Killeen." Page 7 -- "agencies were unanimous in agreeing that the new observation system instituted by Fourth Army provided precise results and definitely indicated that the unknown phenomena in the Camp Hood area could not be attributed to natural causes." Report from Camp Hood/Killeen Base to Commanding General Eighth Air Force, Carswell AFB, Fort Worth, Texas, covering 23 reports of unnatural phenomena from March 6, 1949, through May 24, 1949. 4:15 pm. BB files. Two ladies observed four perfectly silver round flat discs flying in a straight line from southwest to southeast for three minutes. 4:30 pm. Witness observed a disc-shaped object flying low, estimated at 500 feet. Object was 35-40 feet in diameter, 15-18 feet thick, grayish white in color, with steam or vapor streaming from the rear. Object made a complete turn in a small valley and then moved on at at hight rate of speed in a westerly direction. 10:30 pm. 10th District OSI report: Two witnesses observed two objects "like little moons" traveling at a high rate of speed in a northerly direction. This sighting is not listed in the Project Blue Book Master Index. This (the above document) is interesting and useful because it confirms that AFOSI Director Gen Carroll's orders for summary reports were given on or about March 30, 1950, on his visit to Kirtland OSI (17th District), and this resulted in LaPaz's Summary report as well as the OSI 10th District's report here. Note the errors (170-azimuth spread at 1/4-mile in 3 minutes on a linear trajectory is 114 mph not 335 mph) and the somewhat disparaging comments which blatantly disregard the ARMY's initiative and history-making effort in successfully setting up the world's first UFO triangulation network in May 1949. This seems to be some AF-Army rivalry where the AF officer is asking for the AF to set up a scientific study so the AF has something to show against the Army. Afternoon. Veteran radar bombardier said he took pictures of half circular objects over Fort Worth on that Sunday. The article appeared in the Fort Worth Star Telegram on April 18th and the clipping and Spot Intelligence Report is in the BB files. However, the photo shows the objects were creases in the negative and could not have been seen until after the film was developed. This listing is therefore for the record only. Although the next report is only a newsclipping in the BB file, apparently something was going on in Texas that morning, something not explained by weather balloons. 10:45 am. Two witnesses, housewives of military personnel who reside in the North Section of Sherman, Texas, reported that they had observed frcm their residence eighteen (18) to twenty (20) flat circular objects with polished silver surface in the air. These objects were quite some distance away - from thirty to forty degrees above the horizon and were first seen in the West going in a general direction East by Northeast. The objects appeared to have sort of a hocking circular motion and appeared to rotate in a counter-clockwise motion. They made no noise. Objects remained in view four to five minutes. 6:00 pm. M/Sgt XXXX Lackland AFB, and his family observed an egg-shaped object, silver in color, traveling to the NE at 500 to 700 mph. Witnesses convinced that the object was an aircraft. BB files. Several groups of people observed triangular groups of lights, red and green. Objects appeared to be three lights in a vertical plane, hovering and moving about at an estimated 100 mph, along U.S. Highway 81. Listed as item 11 under photographic evidence in the Special Evidence section of NICAP's UFO Evidence, is the Lubbock Texas Lights. These photographs by Carl Hart, Jr., show a V-formation of large circular objects. Capt. Ruppelt, head of Air Force Project Blue Book, reported that "In each photograph the individual lights in the formation shifted position according to a definite pattern." Main photograph reproduced in True, May 1954. Skeptics have always had a field day with this one because it seemed to be only a set of photographs, taken by a young, inexperienced photographer, of geese, later explained as moths. Little did anyone know that even the Air Force, including the professors who also witnessed the overflights, did not buy the explanations. In fact, it appears some people, alerted to UFO activity, saw birds; others saw UFOs. And the most damning evidence against birds, a professional photographer, with professional equipment and better film, could not capture lighted bellies of geese. And that's not all. A swept-back winged object was being seen around the country during the period and two radars confirmed an unknown. Odd "roaring" interference on radio as UFO circled town. A B-50 aircraft of the 509th Bombardment Wing at 15,500 feet Radar observer, Captain James F. McClelland, picked up unidentified object on the radar scope. Rate of closure three times that of B-29. Radar scope photos. Radar observer later reversed his first estimate of the "speed of closure" of the Unidentified Flying Object from 3 times that of a B-50 to that of a conventional fighter plane, after interrogation by a Wing Intelligence Officer. Members of the crews of both the lead aircraft and the aircraft flying the #4 position confirm the presence of the unidentified aircraft, both through visual sighting and its producing a return on the radar scope. For a long time all that was available was the scope photograph. On 16 September 2005 Dan Wilson located documents in the BB Archives, linked below. However, the report was re-evaluated by Tom DeMary and Brad Sparks (Sept 2005) and removed from Unknown status..
10:03 pm. BB files: Boy scouts observed 9-10 circular objects, 4 red, 4 yellow, 1 white. All objects made 90-degree turn. Observatio time: 20 minutes. Brad Sparks: A hoax, possibly a deliberate govt-inspired one. There never was any (Navy is the story) interceptor that shot off a piece of a UFO during the Wash National incident(s) (the rest of the false story). The incident allegedly occurred during the week between the two weekends of the Washington Nationals and was a piece of a concrete-like object found in a forest with broken tree branches above it showing that it had apparently fallen from the sky. It was evidently a rare form of meteorite (and if it could ever be recovered might be worth millions). No one saw any UFO. No one saw any jet interceptor. No jet interceptor pilot ever reported any such firing incident. 8:46-8:53 p.m. USAF pilot Lt. Robert Arnold flying T-28 trainer aircraft at 6,000 ft saw a bright bluish-white glowing object below him rapidly climbing to his level, showing no navigation lights. Arnold tightened his left turn to keep object in view, object suddenly climbed to 9,000 ft in several secs then dropped down to his altitude again headed E to 6 miles SE of AFB where it stopped and hovered. Arnold pursued on SE heading but after 2 secs object suddenly headed towards him on collision course at high speed, wavering slightly at about 300 ft as if determining which side to pass the aircraft then heading off Arnold's left wing at 150 ft distance, at which point he could see object as a blurred reddish­bluish haze smaller than his T-28, all of which happened too fast for evasive action. Arnold in fear turned off running lights, spiraled down to 1,500 ft while keeping object in sight as object continued to head towards him in a dive then pulled up and disappeared. 35 mi west of. Extremely large and intense bright round bluish-white light. Ellington AFB Silver gray bright light with "skipping" motion. 10:00 pm. A T-shaped object was reported to be hovering at 4000 feet over TCU Airport,Texas, near Carswell AFB. The object had varied colors of blue, green, and white. Object was picked up on radar 4 1/2 miles from Carswell AFB. Another object was seen at 2225 hours hovering one mile north of TCU Airport. This was just one day and a few hours before a major SAC exercise of night simulated radar bombing evaluation missions against an industrial complex in San Antonio. Cat 3. Car motor and headlights failed, UFO seen on road. Cat 3. Farmer saw UFO; neighborhood reported TV off at same time. Cat 3. Car radio quit, headlights dimmed, engine stopped; UFO seen hovering low over field. Cat 3. Car motor stalled, radio blanked with static, during UFO sighting. 10 miles west of. Military pilot saw an oval reddish object the size of a pinhead. Cat 3. UFO crossed road ahead of car at low altitude. Motor and headlights failed. 3:00 am. "... a glowing UFO hovered near Sherman, TX. Broadcasting stations, police, and other agencies had been flooded with reports for hours. Television cameraman Robert Campbell was out with Patrolman Peter McCollum, interviewing witnesses and watching the objects for themselves. Campbell took a still picture of the hovering UFO [footnote 1] - a two minute time exposure while he and the police officer watched the thing. The picture was overexposed, possibly due to the brilliance of the UFO..."
Cat 3. Domed disc swooped over truck, landed on road, blocked highway. (L) (Section VI UFO Evidence). Cat 3. Saturn-shaped UFO over truck, beamed light down; humanoids visible in dome. (See section XII, UFO Evidence). Cat 11. Object with row of lights overtook DC-10. Cat 3 and 11. Private pilot and T-38 pilot encounter object, E-M reported. Cat 5. Cash/Landrum Case. While driving through the Piney Woods of East Texas, about 40 miles northeast of Houston, Betty Cash and her two passengers noticed a bright light ahead. As they drew within about 130 feet (40 meters), they were confronted by a fiery diamond-shaped object, emitting flames down toward the road. What happened after that is mind-boggling. Physical burns and apparent radiation sickness reported. Cat 9 and 11. 10:30 a.m. Captain and First Officer of America West Airlines Flight 564 reported a large silhouetted cigar-shaped object, pulsating lights along body. An America West B-757 airliner was cruising at 39,000 feet near Bovina, Texas, en route from Tampa, Florida, to Las Vegas, Nevada. When the background clouds pulsed with lightning, they could see the silhouette of a dark, wingless, elongated cigar-like object around the strobing lights. Estimated to be 300-400 feet long. The bursts of speed were computed to be between 1,000 and 1,400 m.p.h.